LOS ANGELES, CA - MARCH 26: LeBron James #23 of the Los Angeles Lakers handles the ball against Troy Brown Jr. #6 of the Washington Wizards on March 26, 2019 at STAPLES Center in Los Angeles, California. Every NBA rookie goes through ups and downs. The interview and workout process and draft itself are just the beginning, while the unseen hours in the gym that follow can be difficult on an 18-year old. Adjusting to NBA game speed is no joke, and moving to a new city for the second straight year requires one to grow up fast. Cracking the rotation takes time, and may even require some time in the G League. It’s all worth it when they announce your name as a starter, but getting there is the hardest part. 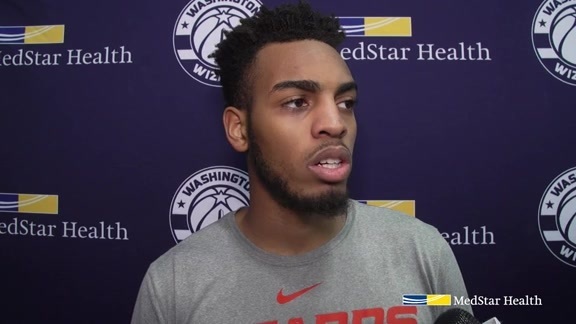 Troy Brown Jr. went through it all in his rookie season, but it’s all been part of his journey with the Wizards that started all the way back in June. When Brown showed up for his pre-draft workout in Washington, D.C., he impressed with his high basketball IQ. Wizards head coach Scott Brooks challenged Brown to draw up a play during his interview. Brown ended up drawing up several, and Brooks was especially impressed by one in particular. Needless to say, Brown left a lasting impression. In addition to his high basketball IQ, the Wizards were intrigued by Brown’s size and versatility, as Brown stood 6’7” with a 6’10” wingspan and was projected to play four positions. The team was also impressed by Brown the person: he interviewed well, came from a close-knit family environment, and demonstrated maturity and leadership for his age. The Wizards believed Brown possessed the right balance of skill and intangibles necessary to make it in the NBA, and drafted him 15th overall in the 2018 NBA Draft. Brown showed off that versatility in Summer League, guarding multiple positions and handling the ball at times. Playing at home in Las Vegas, Brown averaged 18.4 points, 6.8 rebounds, and 1.4 steals per game. He finished fourth among rookies in scoring, only behind Kevin Knox, Collin Sexton, and Shai Gilgeous-Alexander, all of whom have started 55 or more games this season. Only 18 years old at training camp, Brown did not know what to expect his rookie season in Washington. He was joining a team with the likes of John Wall and Bradley Beal, with now-departed Otto Porter Jr., Kelly Oubre Jr., Austin Rivers, and Tomas Satoransky expected to get playing time ahead of him. Patience and development were going to be two words Brown heard on repeat. 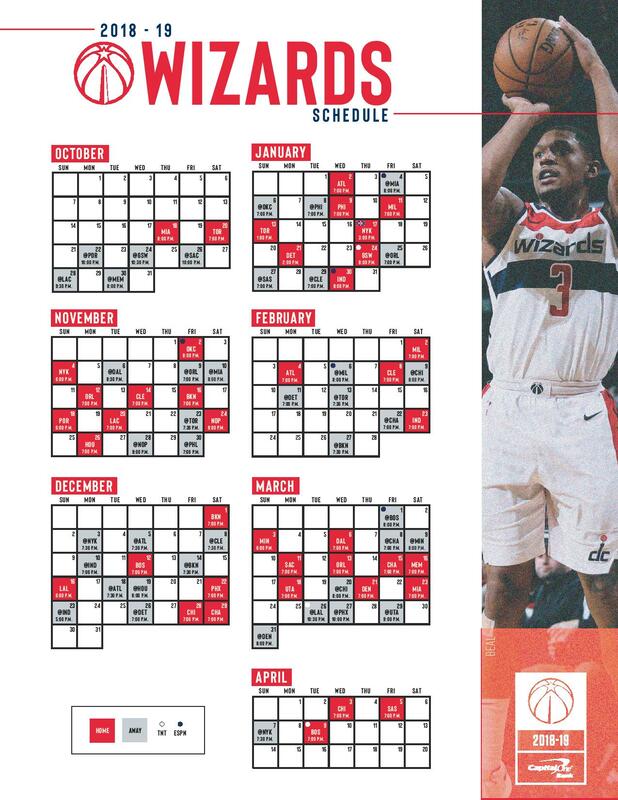 The plan entering the 2018-19 season included having Brown split time with the Wizards’ new G League team, the Capital City Go-Go. There, Brown would get the necessary experience and development, giving him confidence to play at the next level. He only played 42 total minutes in the Wizards’ first 17 games. On November 23, Brown was assigned to the Go-Go, the first of 11 games in the G League. The 15th overall pick was admittedly frustrated to play in the G League, but it was a necessary part of his development. The Wizards needed to find him playing time, and having a G League team in the team’s backyard gave Brown an opportunity to grow. 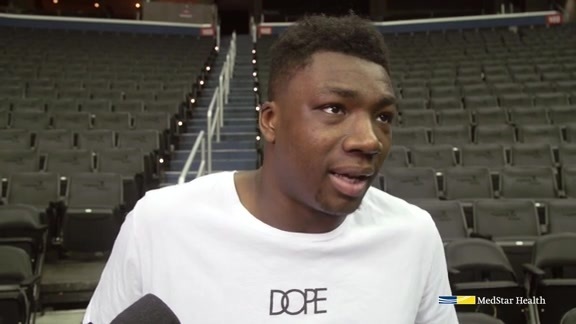 Brown went up and down with the Wizards and Go-Go for a few months. He worked out every day, played for the Wizards and Go-Go three to five days in a row on occasion, and was traveling like crazy. Few people outside of the organization saw how hard he was working, but Brown reminded himself ad nauseum that it was part of his journey. It was a hectic first half of the season for any player, but especially for a rookie. Teammates, coaches, family members, friends, and those around Brown kept him focused on the big picture. Go-Go head coach Jarell Christian was one of those people. Brown was up with the Wizards on February 2 when he suffered a left ankle sprain late in the game. The team decided to hold him out from games for three weeks, allowing the now 19-year old to fully heal with the All-Star break approaching. He would return with the Go-Go on February 22, scoring 22 points in his first game back from injury. Brown was recalled to the Wizards on February 23 and played four minutes, but February 26 would be his final game with the Go-Go. Since February 27, Brown has played at least 13 minutes in every game, a number that has significantly grown since mid-March. After Trevor Ariza tweaked his groin against the Bulls on March 20, Brown started the second half with the Wizards’ usual starters. When it was clear Ariza could not play the next day against the Nuggets, Brown had a feeling he would earn his first career NBA start. The intuitive rookie was right. On March 21, Brown started his first career game, scoring 13 points on 6-of-10 from the field, along with five rebounds and three assists in 33 minutes. It was the culmination of all of his hard work in his rookie season, something Scott Brooks, Christian, and teammates like Bradley Beal saw first-hand. Beal has been one of the many veterans in the locker room Brown has relied upon in his rookie season. Their lockers are right next to each other in the Wizards home locker room. In practice, Beal is vocal and has proven to be a natural-born leader this season, especially when Wall went down. Brown is impressed by Beal’s work ethic and considers him a role model. The veteran has taken the rookie under his wing, and it’s clear that they’ve developed a special bond. Bryant, 21, has been there since the start of this journey. As the youngest players on the team, he and Brown have formed a life-long bond this season. They live in the same apartment complex in D.C., and do just about everything together. Their friendship has only strengthened as the season has gone by, with both going from afterthoughts before the season to starters and significant pieces moving forward. “It’s been great to just see him stay poised and stay on the right course throughout the whole year, with all of the ups and downs we’ve been having,” Bryant said about Brown. “For him to just come in and do his job, and do even more than we ask him to do, it’s great to see. Ten days after Brown’s first start, his best game as a pro also came against the Nuggets. On March 31, Brown led the Wizards to an impressive 95-90 win in Denver, anchoring the team on both ends of the court. The rookie finished with career-high 24 points on 9-of-16 field goals, including 5-of-7 from beyond the arc. In a career-high 42 minutes, Brown also grabbed seven rebounds and held his matchups to 3-of-21 shooting. After the win, Beal and Brown embraced on the court, sharing another moment in Brown’s journey. Barring a setback or unforeseen move, Brown will close the season with 10 NBA starts and plenty of experience under his belt from the past few months. He’ll head into his second season expected to play a bigger role, especially with Wall missing at least a majority of next year. Still, Brown wants more; he’s a determined player who tries to get better every day. He watches film from every game and looks back to see how he can improve. He’s become more familiar with personnel around the league and has proven to be a quick learner. Over the summer, Brown will focus on muscle gain and fine-tuning his game. That includes his jump shot, which has already improved significantly this season. Since he’ll already be working out in Las Vegas, Brown is planning to play in NBA Summer League again in July. His development and evolution from year over year will be fun to watch, and the Wizards certainly don’t have to worry about Brown lacking motivation.